The Shrine of Saint Veloth is a ruin in eastern Deshaan, north of the Tal'Deic Fortress. 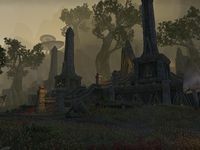 Shrine of Saint Veloth Objective: Restore Saint Veloth and stop the Daedric incursion. A Saint Asunder: Restore and cleanse the Shrine of Saint Veloth. The Wounds in the World: Shut down the Daedric portals spewing enemies across the countryside. A Time for Mud and Mushrooms : Seal time breaches in the swamps of Deshaan and Shadowfen. This page was last modified on 9 February 2019, at 01:07.